My husband inherited his father’s Navy cutlass and wanted to display it somehow. 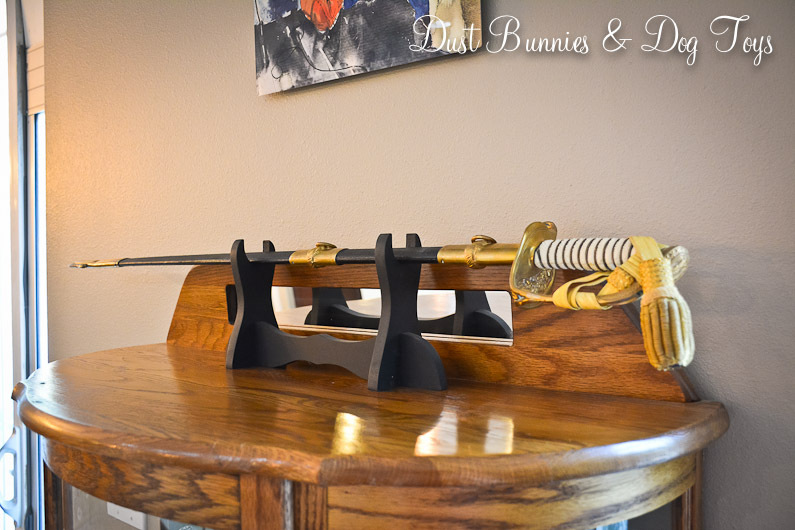 I knew there were sword stands that would work and researched a couple online. I originally planned to have a custom one made by the same artist who made his coin holder, but the price was a bit excessive for something that wouldn’t get much notice. 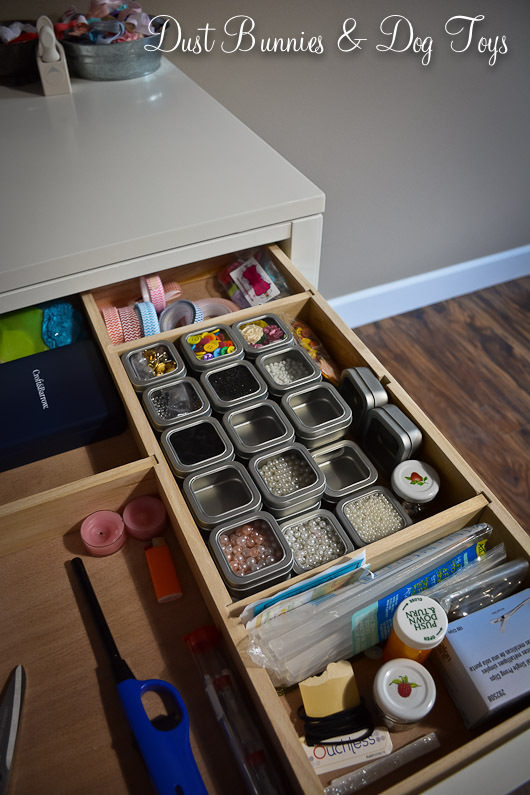 At one point the hubs considered making a stand, but that would have required several new tools – which was probably his real motivation – and time that could be spent on other more important projects. When I found a basic wooden stand on a discount website I ordered it right away. Unfortunately, I soon got an email that they wouldn’t ship to Alaska and had to cancel the order. I searched on and off for the next few days and finally found one for about $15. A few dollars more for shipping and it was on it’s way. It’s definitely not fancy, but it does the job. And because we display the flag from his dad’s service in front of the sword you really don’t see it anyway. 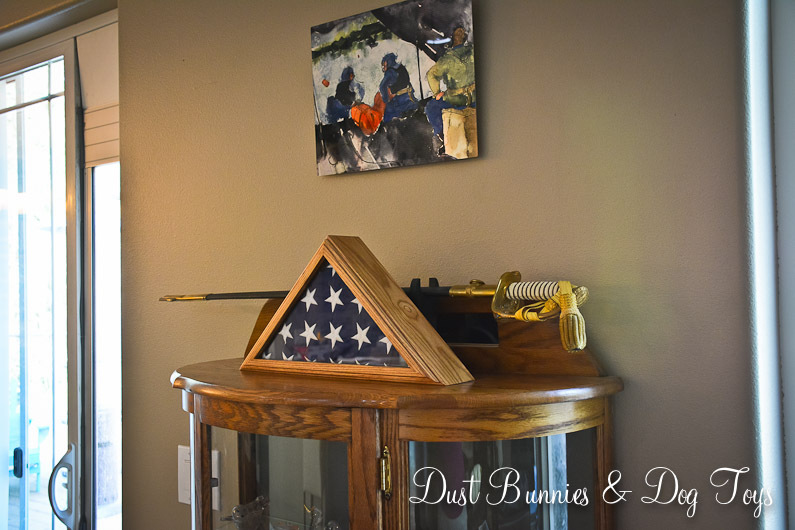 Together they make a simple display to honor his dad. 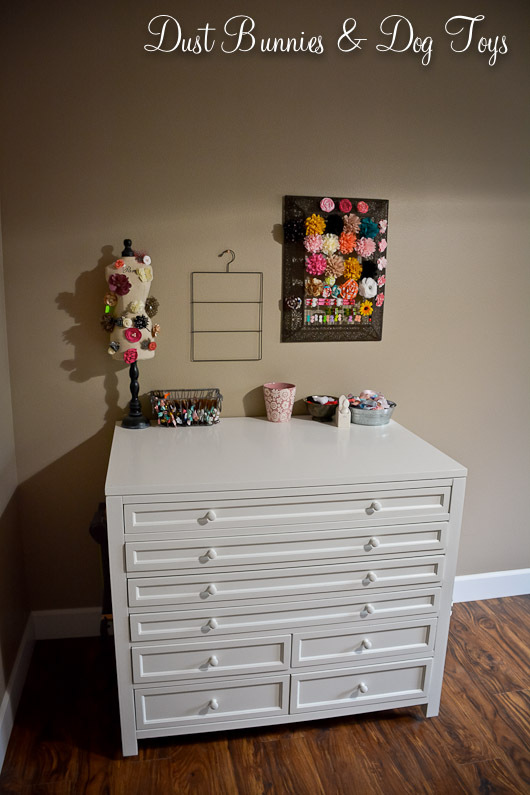 And I find it fitting that the custom art I had created from a drawing of the hubs in service hangs above them both. Want some history on the traditions of the Navy Cutlass? This website details the origins of the Navy sword and it’s demise with the advance of modern warfare. Entrance ramps are usually designed to give you an appropriate distance to match the speed of on-coming traffic and merge in without causing disruption to the flow of vehicles. Don’t “putz” down the ramp and then hesitate when faced with moving traffic as your lane ends. Most motorists are fine with others merging in front of them IF you match their speed before moving over and may even flash their lights to signal that they anticipate you moving in. I also typically follow a general rule of one oncoming car between each highway vehicle. Most exit ramps are also designed to allow you to slow down after leaving the highway, so please don’t reduce speed prior to taking your exit unless you are hauling a load that requires it. When there are two lanes in the same direction stay right except to pass, especially in hilly areas. If you do pass slower traffic, remember to move back to the right once you’ve given the other vehicle enough room. Remember that large trucks with trailers can’t stop as quickly as your single vehicle. That’s why they need extra space in front of them when behind other traffic, so don’t see that big open spot as an invitation to whip over in front of them. They also need extra room to turn because they have to compensate for the length of their rig, so don’t try to squeeze in next to them as you approach an intersection. That long load also prevents them from seeing you behind them, even at what you might think is a ‘safe’ distance. A good rule of thumb is if you can’t see the trucks mirrors, he can’t see you. Yield to emergency vehicles when their lights and/or sirens are active unless you’re on a divided road. When you see an approaching response vehicle, slow down and move to the right if it’s safe to do so, without cutting off other motorists. Failing to do so is illegal in most countries and delays emergency personnel from reaching those in need as quickly as possible. React how you would want others to if you were the one on the needing end of those emergency services. Slow down as you approach emergency vehicles on the side of the road, but don’t stop and gawk at the situation. It’s usually just someone getting a speeding ticket or a minor fender bender – nothing to write home about. But your brief pause to check things out delays traffic behind you and can cause a chain reaction that could result in a mile long back-up. Or even worse, your nosiness could cause you to not pay attention to those in front of you, creating another fender bender. Don’t think that it’s your responsibility to slow down speeders or teach other drivers a ‘lesson’. If you see someone driving irresponsibly, call the authorities and let them handle the offender rather than goad them and create a situation of road rage that could spiral out of control causing others injury. While touring my Mother-in-law’s neighborhood on our recent trip I spotted a beautiful craftsman style home that I adore. 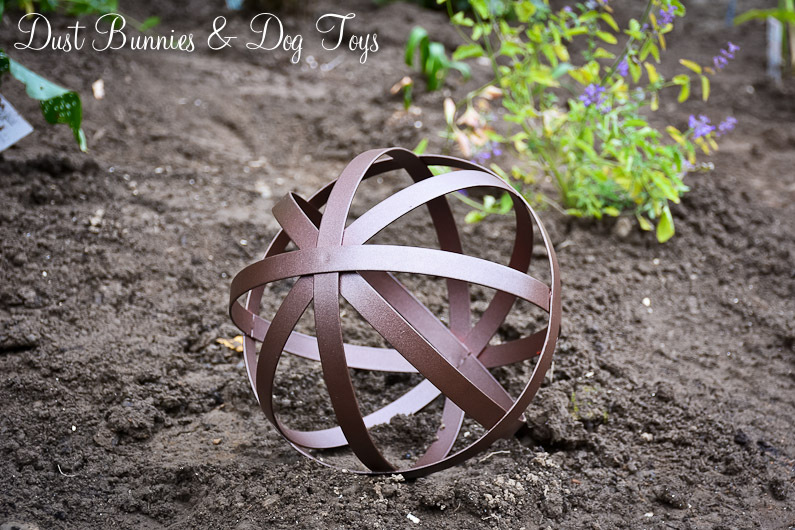 In addition to beautiful timber columns on the porch they had a large rustic metal sphere in their landscape that I fell in love with even though I it was likely a designer piece that was light years outside my budget. 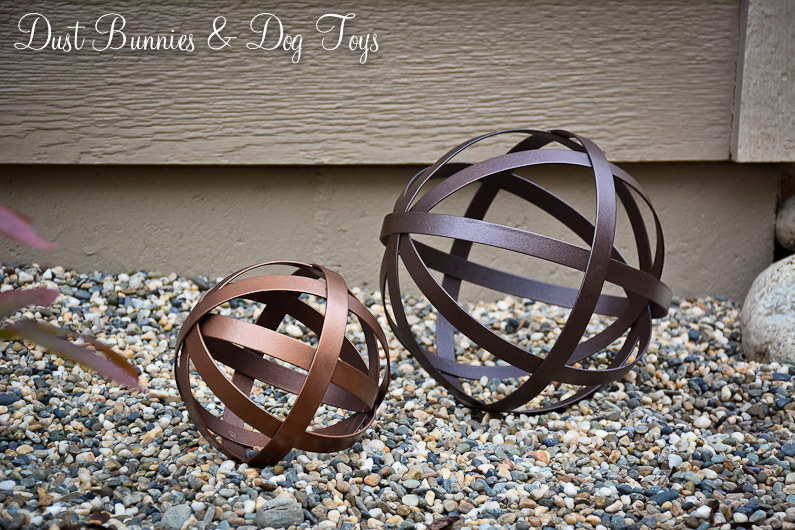 I thought about that metal sphere on the drive home and decided to look for a way to DIY my own. 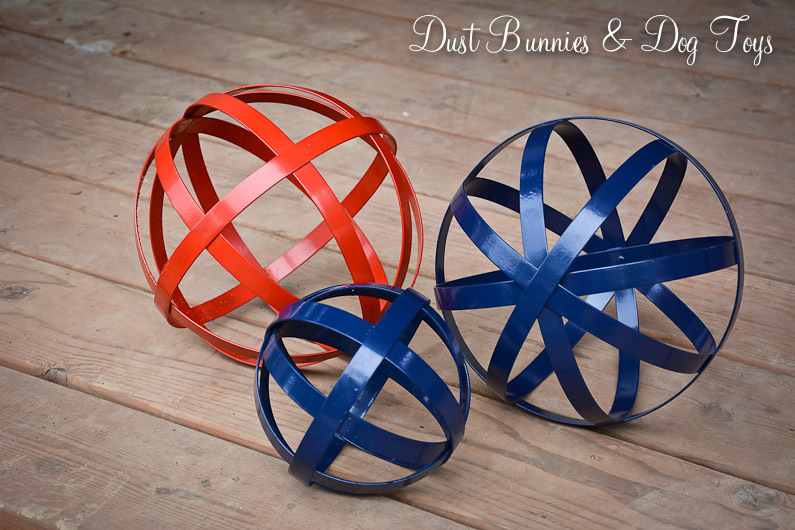 I’d seen several similar projects for light fixtures so I knew it was doable. I just had to find a material that could stand up to the elements. I pinned a couple of ideas, but put the project on hold since I had several others already in the works. Then I happened to spot these beauties on a Target clearance rack! They weren’t the color I wanted, but I knew a coat of spray paint could fix that. I got all three for about $21. I all but danced out of the store! They lived as is in the flower bed for a while since I was busy with those other projects I mentioned, but when I started spray painting my cache pot from yesterday’s post I decided to knock these out as well. 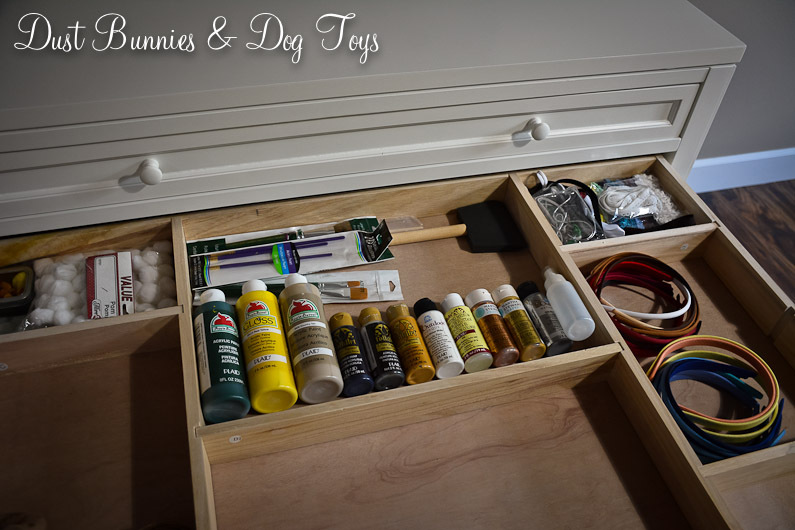 Remember the pretty little cache pot I created a while back? Well it had a little defect. You see the lid fit so snugly that when you went to remove it you had to hold the pot itself to pry it open. And when it did open the motion created caused the contents already inside to move. Sometime so much that they escaped – onto the person opening it. 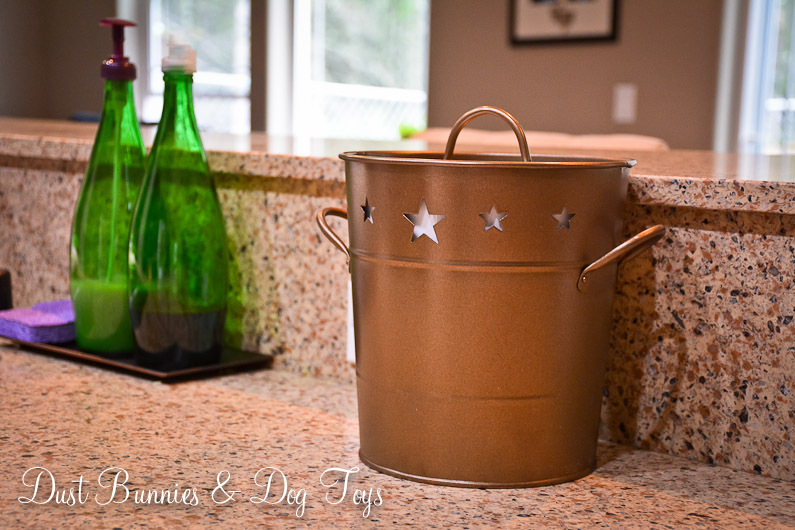 That’s why my pretty copper canister became cabinet top décor and a replacement was found. Shortly after we moved to the mainland I purchased this ice bucket at JoAnns on clearance for something like $5. And then I never used it. 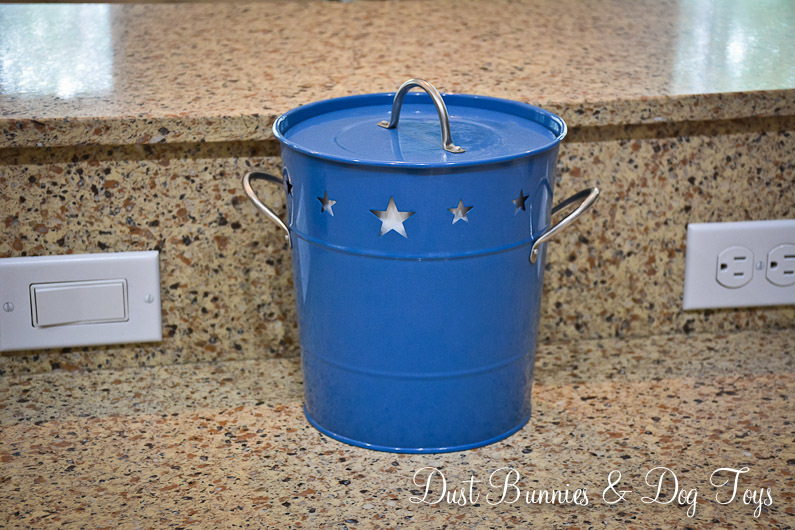 Since my inspiration to DIY a cache pot in the first place came from an ice bucket I decided to give it a try and set it out on the counter for a test run. It was easy to open – just lift the lid. It was easy to clean – just pull out the insert dump and put in the dishwasher. And it was the perfect size. Unfortunately, it wasn’t the perfect color. But that’s nothing a coat of spray paint can’t fix. A few coats of spray later and wha-la, I have a new cache pot! Plus because I already had the bucket and the spray paint it didn’t cost me a dime! I’m still not crazy about the stars, so I might rig something to cover those, but for a totally free project I’m not gonna complain. 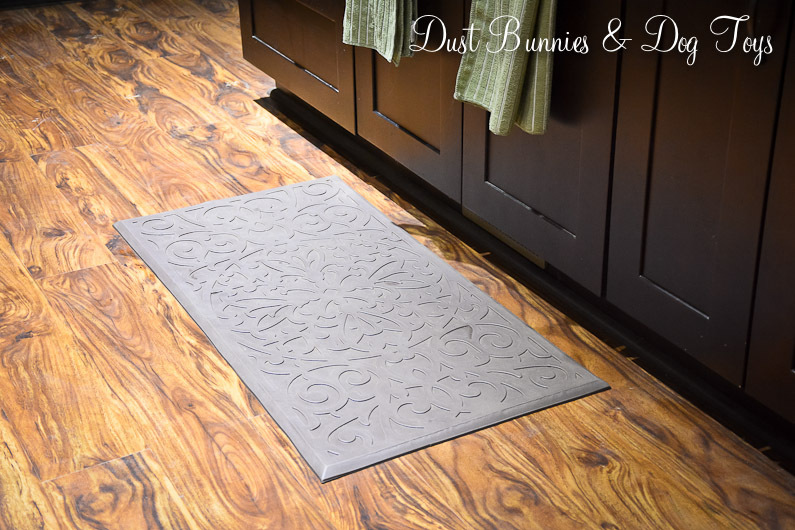 When we decided to do vinyl floors throughout our house due to my allergies and desire for easier cleaning I knew I’d be on the hunt for several area rugs once we moved in. It’s been more difficult than I imagined finding just the right rug in the right size at a price I can swallow, which is why none of our bedrooms have rugs as of yet. However, I did find some smaller accent rugs for great prices at CostCo while in Portland. 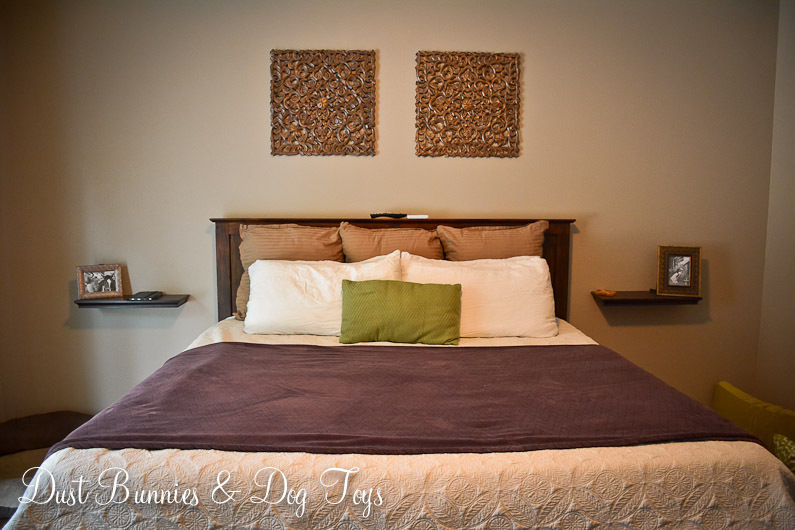 When we first moved in I used two brown memory foam rugs we had in our master bathroom at the rental in the kitchen. They worked ok, but they required constant cleaning and didn’t play well with the vacuum. Plus they tended to wander across the floor with the assistance of running paws. I’d considered getting some of the fancy gel mats you see at the specialty kitchen stores, but just couldn’t justify $200 on such a small item. So when I spotted these knock-offs for just $14 I quickly plopped two in my cart. 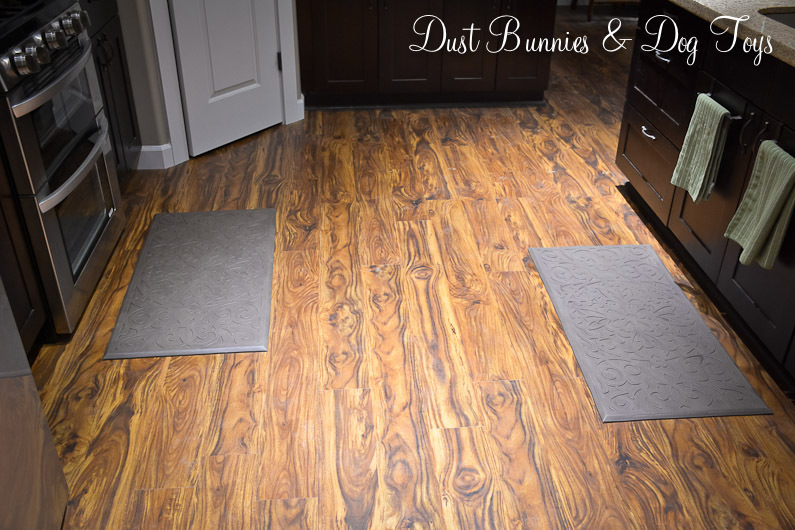 Although they aren’t quite as nice as the specialty store variety, they feel good underfoot, stay put where placed and don’t surrender to the vacuum. I occasionally use a Lysol wipe to get any lingering dirt, but overall they have been a perfect fit for this spot. My next bargain find were these runners at $10 each. 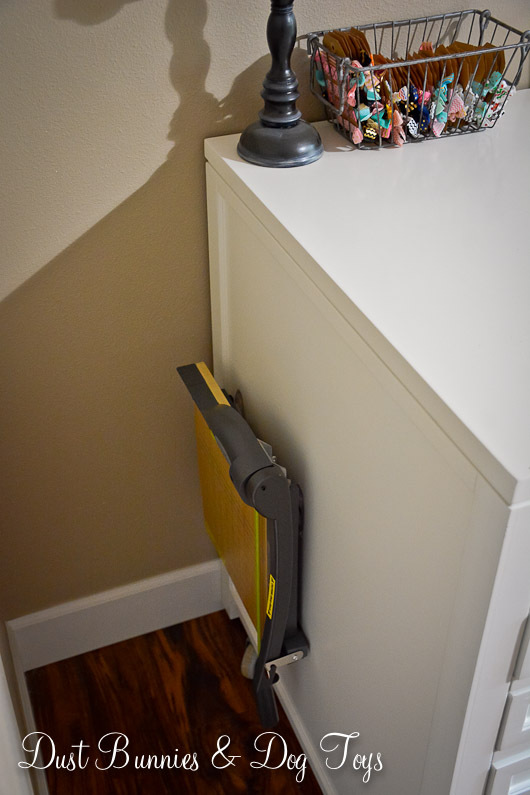 I planned to use one in the master closet and one in the laundry room, but they were a little too narrow for both spaces, so I paired them up to cover the access panel in the closet floor. 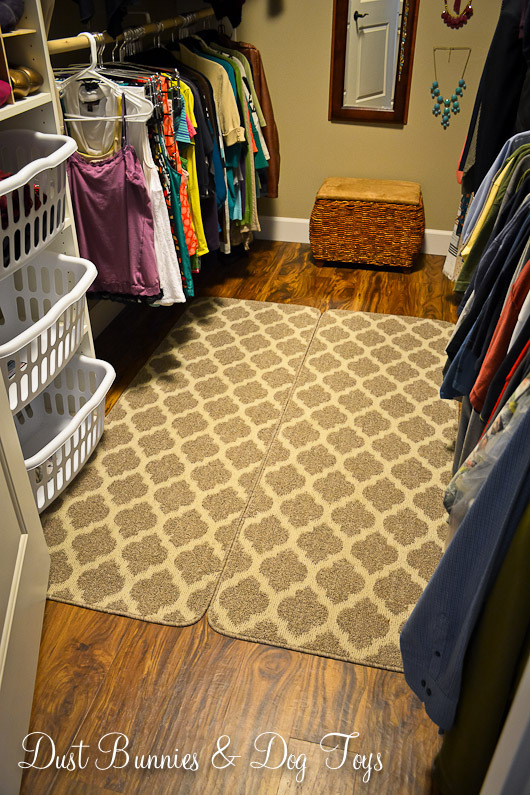 Eventually, I want a single rug in here that either matches or coordinates with what I select for the Master Bedroom, but at just $20, this will work for now. 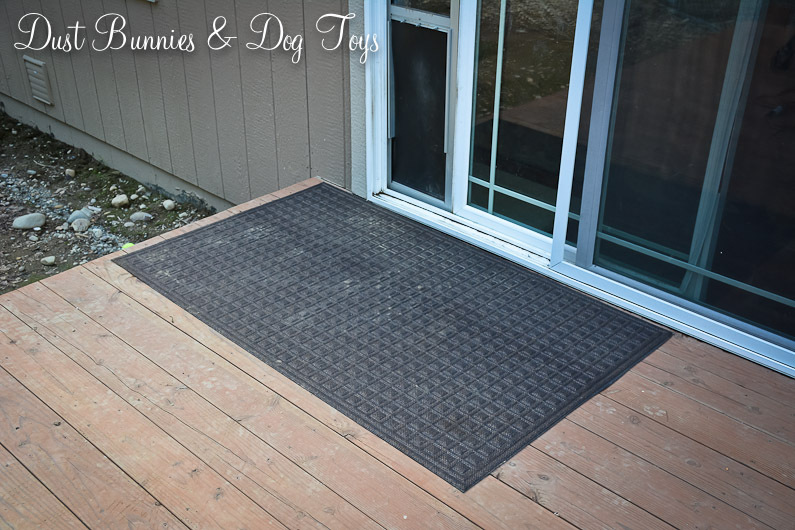 The hubs pointed out some indoor/outdoor mats similar to what his mom has in her garage since I’d mentioned how I liked them. I thought they were a little pricey at $20, but I knew it would be a good option for the back door where the dogs come in and out. I was glad to see that it covered the large opening, plus a little extra, so it catches dirt from both paws and feet, as you can see. It’s certainly reduced the amount of dirt making it inside! I almost bought a second for the laundry room, but I was pretty sure it would be too wide and not long enough. I decided I’d try the one in the laundry room first and if it did fit then it could stay there and I’d check our local CostCo for another for the back door. But my assumption was right and it just didn’t fit the space properly, so the hunt for a long, yet sturdy runner for the laundry room continues. 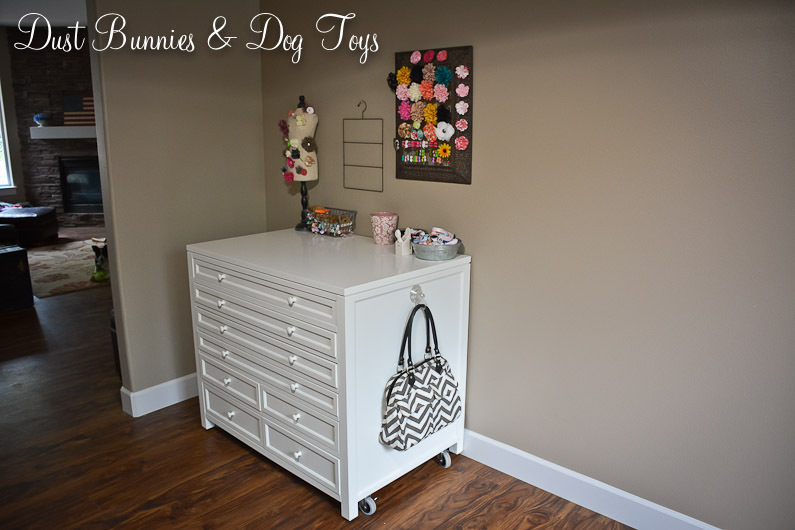 I wanted our Master bedroom to be very simple and calming, so I purposely kept things in this space to a minimum but it was lacking character. I knew I wanted to add some sort of textured art, but hadn’t found anything just right. Then I spotted a wood carving on clearance at Pier 1 while on our trip down south and knew I wanted it for this space. Unfortunately, they only had one. Luckily, the store across town still had a few, albeit not on clearance and they were able to do a phone purchase so I could pick it up later that day. I originally planned to hang them over the night stands, but when I tested that idea the space above the bed felt too empty. Although they are fairly large, they weren’t big enough to take up the whole width of the bed, so I opted to center them with some extra space in between. I decided to hang them half way between the top of the head board and the ceiling since it is such a large space. Once they were hung I almost wished I’d bought a third, but I think that might have felt a bit too fussy. I also hung this watercolor print by an Alaskan artist on the small wall by the bathroom door across from the bed. 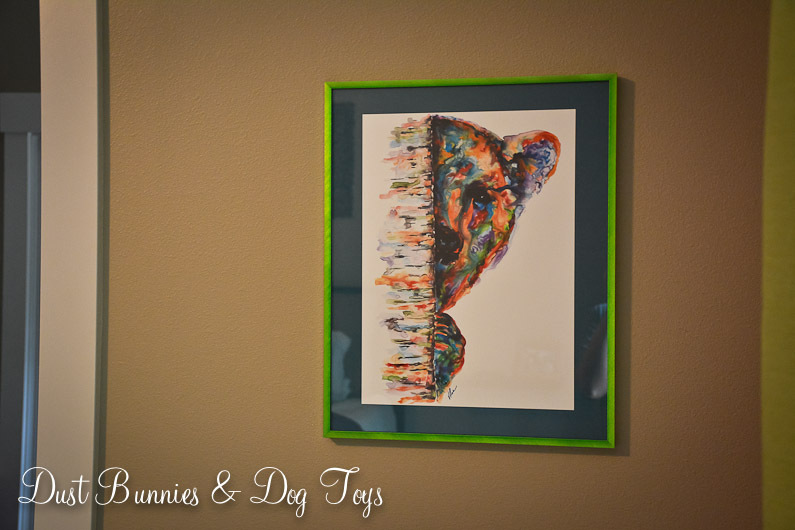 We purchased it during a trip and got a super sweet deal, frame and all! It’s a favorite of mine and the hubs, so it’s fitting that we wake up to it every day. Plus the colors work well in this space.